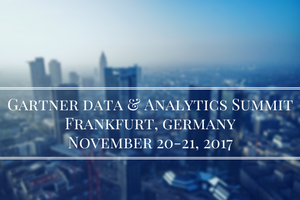 Later this month, on 20th and 21st November, Dimensional Insight, authors of Diver software, will be attending the Gartner Data & Analytics Summit in Frankfurt, Germany. They are very much looking forward to attending the educational sessions with Gartner analysts, learning from our peers all across Europe (and the globe! ), and of course, meeting with attendees. Are you attending the summit? If so, here are 5 reasons to swing by our booth and meet with us. Dimensional Insight will be exhibiting in booth P5 on the main show floor.